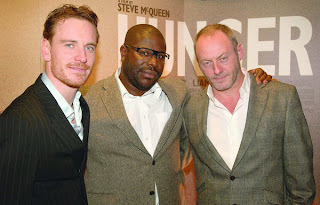 Michael, Steve, Liam and other cast members of 'Hunger' were at the Belfast premiere of the movie last night. As expected, Michael looked great, but his hair is shorter than when I met him in Toronto just 5 weeks ago. This image is from the Irish Times article McQueen wins plaudits for 'humanity'. And here is a notable quote about the film from Sinn Féin MLA Raymond McCartney who knew Bobby Sands very well and was on a hunger strike himself for 53 days (Sands lost his life to his hunger strike which lasted 66 days). "People should make their judgment after they see the film, not before it," he said. "If Steve McQueen makes a film in a particular way, go and watch it, and then come out with whatever criticism you have. Certainly I hope that my particular view of this period is reflected in the film, but if it's not then you can have a discussion about it afterwards," added Mr McCartney. I look forward to seeing Hunger again, and as a matter of fact, I told my friend Lucinda in London to please go see it at the London Film Festival as it screens there over the weekend. I think she will, and if she does, I'll let you know what she thought of it. The '300' viewing with Laurie was a success last night. She absolutely understands why I like Michael and anointed him my 'imaginary boyfriend'. Whatevah.